For other versions, see Battlefield (disambiguation). Battlefield, officially Duel Zone (デュエルゾーン, Duel Zone) and also known as the Fighting Polygon Stage, is a stage in Super Smash Bros., home to the Fighting Polygon Team in the 1P Game. The name "Battlefield" is retroactively applied to this stage, as redesigns of this stage that have appeared in later games in the series share that name, and no name in other languages was widely-known before the Battlefield name was popularized. However, this stage's official name in Japanese, デュエルゾーン, Duel Zone, doesn't match the name for Battlefield in the Japanese versions of Melee and later games, all of which use the name 戦場, Battlefield. 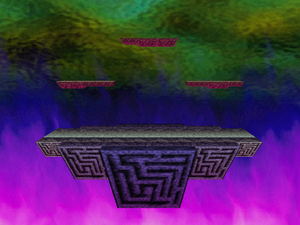 In addition, the music for this stage appears in Super Smash Bros. Ultimate under the title "Duel Zone", confirming its English name as also dissimilar from its successors. Battlefield in a hacked VS Game. Like its successors, it features a large main platform with three overhanging soft platforms. 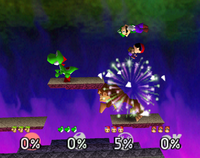 It is overall smaller than the Melee and Brawl versions, and also lacks Melee's infamous ledges on its main platform. It also has a higher ceiling than its Melee counterpart. The only way to use the stage for a multiplayer match is through hacking. The stage is banned in competitive play: besides the fact that it needs a hacking device to be accessed, there is also a glitch where characters are automatically KO'd if they Smash DI into the stage. However at some tournaments like GENESIS 5 it was a legal counterpick stage for doubles. This is the only Battlefield that is not a playable stage in VS Mode without hacking. This page was last edited on December 27, 2018, at 18:33.